Note: this piece is intended as a follow-up to my earlier, preliminary analysis of the unidentified munitions claimed to have been used to deliver chemical agents in Syria. It will repeat a little of the material covered in the earlier piece as it is intended to be translated and made available in Arabic. It should be stressed that this is still a preliminary analysis of the limited photographic and videographic material available. It is still not clear whether these munitions carried a CW payload, nor are their origins yet known. UPDATE 31/08/2013: A second update including more details is available here. It appears increasingly likely that munitions of this variety are produced in at least two sizes. UPDATE 07/09/2013: An earlier version of this post, translated into Arabic, is available here. In an earlier post, I conducted a preliminary analysis of the unidentified munitions alleged to have been used in suspected chemical weapons (CW) attacks in Syria, particularly the attack in Eastern Ghouta. The video below shows the delivery, loading, and launching of one of these unidentified munitions, apparently by regime forces. The video, which was announced on the ‘Darya Revolution’ Facebook page, claims to show the launch of a rocket with a CW payload from Mezzeh Military Airport, on the Western edge of Damascus, towards Eastern Ghouta. The rocket in the video is a strong match for the type of munitions documented in Daraya, Khaladiya, Yabroud, Adra, Eastern Ghouta, and Zamalka (see complete list at the end of this piece). The video shows several men around the launch site wearing red berets, which is apparently typical of the uniform worn by the Syrian Republican Guard. This is consistent with reports from Israeli sources that rockets containing chemical agents were fired by the 155th Brigade, 4th Armoured Division, which is closely aligned with the Republican Guard. Both units are commanded by Syrian President Bashar al-Assad’s brother, Maher al-Assad. The 155th Brigade’s base is believed to be close to Mezzeh airport. Eliot Higgins has calculated the precise impact location of one of the unidentified munitions, with findings that may indicate similar launch sites. It is interesting to note that the figures loading and firing the weapon appear to be in civilian attire, rather than the military uniforms seen on others in the video. [UPDATE: it appears increasingly likely that these munitions have been produced in at least two sizes. Whilst Falaq-2 launchers, or close copies or derivatives appear to be in use with munitions of this type (see below), this launcher may be a larger calibre system developed along similar lines.] These are seen in one, two, three, and four-tube configurations, and have been seen fitted to both military and civilian type trucks and semi-trailers. These may have been acquired from Iran, or may be a copy of the Iranian design. Falaq-2 type launchers are known to be in use with government forces in Syria already, having been reported towards the end of last year. Typically, the Falaq-2 launcher is used in conjunction with a 333mm FL2-A rocket of 1820mm in length, carrying a high explosive (HE) warhead – considerably shorter than the unidentified munition in question, which appears to be at the very least 2800mm (and possibly upwards of 3000mm) in length. 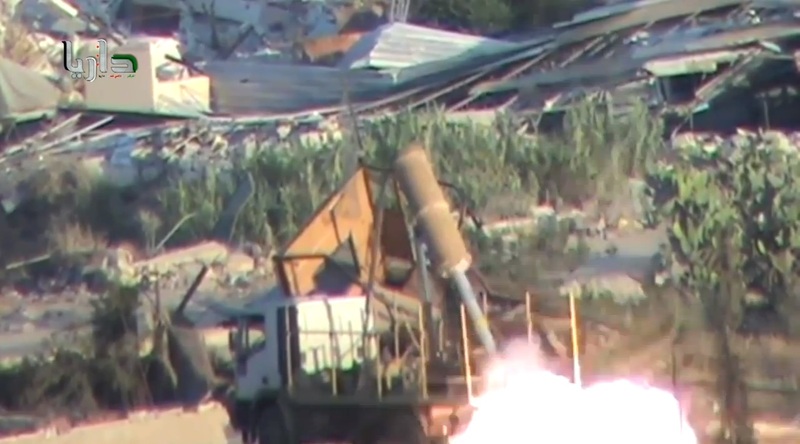 The video below, Published in December 2012, shows a two-tube Falaq-2 type launcher being fired from Mezzeh Military Airport, allegedly towards Daraya. This is consistent with the claims accompanying the video above. The munitions themselves are non-standard surface-to-surface rockets of at least 2800mm in length. The long motor body is likely designed to increase the static margin of the rocket, which would improve stability in flight. It is possible that these munitions are produced in differing lengths. Given they are fired from a Falaq-2 type launcher, the diameter of the munitions is likely close to 333mm. It is possible there is a larger diameter variant produced. It is unclear whether the rockets are manufactured in Iran – they do bear some similarities to other munitions thought to be produced there – or whether they were produced in Syria to suit the Iranian launch system. The tail of the munitions (pictured below) features a straight fin assembly with a ring aerofoil, and a single large exhaust nozzle for the rocket motor. The payload section of the weapon is notably larger than the body section and approximately the same diameter as the fin assembly (possibly slightly larger). It appears to be thin walled, which would indicate the requirement for a high fill-to-weight ratio. However, this would be decreased by the large central body section. One suggestion which was made to me is that the munition is a slip-fit modification of an existing rocket. The bolt seen in the tail image below may have been threaded into the outer material as a pressure hold, typical of a sleeve fit mechanism. Given their build quality and uniformity of appearance, these munitions are unlikely to be improvised devices. It is possible that these munitions are not CW delivery devices at all, and are designed to carry a fuel-air explosive (FAE) or HE payload. FAE rockets of similar construction can be seen in the US Surface-Launched Unit, Fuel-Air Explosive (SLUFAE) and Israeli CARPET rockets. It is also a possibility that the munitions were produced in several variants, including a CW variant, or that certain rockets were converted to carry a CW payload at some point after manufacture. FAE or HE weapons could, with varying degrees of difficulty, be converted to deliver a liquid CW payload by replacing the payload of the munition with a chemical agent. A yellow band, seen on one of the munitions (image below), may indicate a different fill type. The warhead in question appears to contain a powdered substance which is more likely to be a HE fill. The fuze or type of fuze used with these munitions remains unknown. Whilst a Soviet ATK-EB mechanical time (MT) fuze (pictured below) was found near one of these munitions in Eastern Ghouta, it is unclear whether this was from the rocket itself, or from another munition (perhaps related to the airstrikes that followed the alleged CW attack). A MT fuze, whilst a viable option for rockets of this type, would not be the ideal choice. It is also worth noting that the majority of the munitions recorded appear to have functioned as intended. If a MT fuze was used, this may indicate that the operating party was familiar with the weapon system and capable of effectively calculating and setting the MT fuzes to their appropriate delays. The earliest video of this type of munition appears to be from an attack in Daraya in January of this year; however, there were no claims of a CW attack at this time [Update: an image of a Falaq-2 launcher with the tail fin assembly of a loaded rocket visible has been added at the top of the page, and reproduced below. 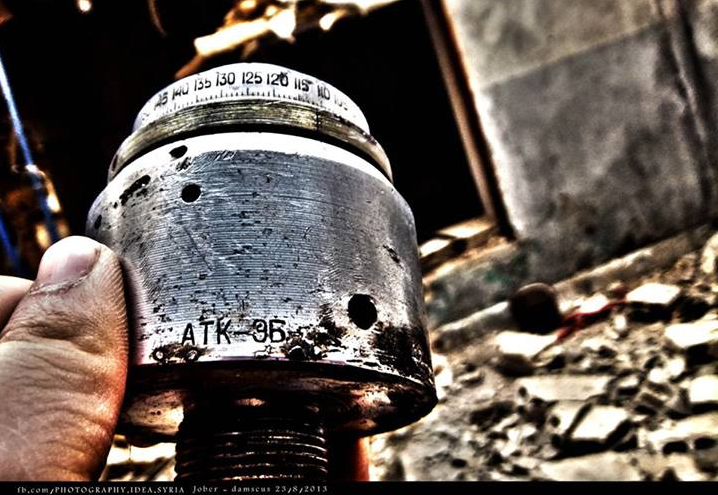 This image was taken on the 17th November, 2012 by Alzahraa Alep News, and appears consistent with the unidentified munitions]. Indeed, it appears that at least one of these munitions has been observed with what is more likely a HE payload. Videos such as the one below appear to indicate that any CW agent that may be present is either non-persistent, or that some or all of the munitions carried an alternative payload, as discussed above. The UN chemical weapons inspection team have been filmed inspecting one of these unidentified munitions in Eastern Ghouta. In the first of the two videos below, members of the UN inspection team document and take samples from one of the munitions (note distinctive tail fin assembly in rubble at right) and its impact site. The UN team have also documented a second potential CW munition, in Medmah Sham, seen in the second video below. This is a Soviet 140mm spin-stabilised rocket generally fired from the BM-14 (-16/-17) and RPU-14 systems. It is known produced in several variants, including the M-14-OF HE-FRAG munition and the M-14D white phosphorous (WP) smoke munition. Whilst a 140mm rocket known variously as the ‘M-14-S’ or ‘MS-14’ was produced with a 2.2kg Sarin payload, it is not believed to have been in the Syrian arsenal. The system has a maximum range of approximately 9.8 kilometres. SIPRI’s trade registers indicate some 200 BM-14 systems were sold to Syria by the USSR in 1967 to 1969. 5.) The munitions are possibly produced in at least two different sizes (one of larger diameter and greater length than detailed here). Of course, whilst none of this material constitutes explicit evidence of a CW strike by Assad’s forces – that’s a question for the UN team – it does add more pieces to the puzzle, and documents the use of a recently unknown munition in conjunction with an Iranian type launcher, purportedly by Syrian government forces. Here is a partial list of where the unidentified munitions have been recorded, broken down by date and location. 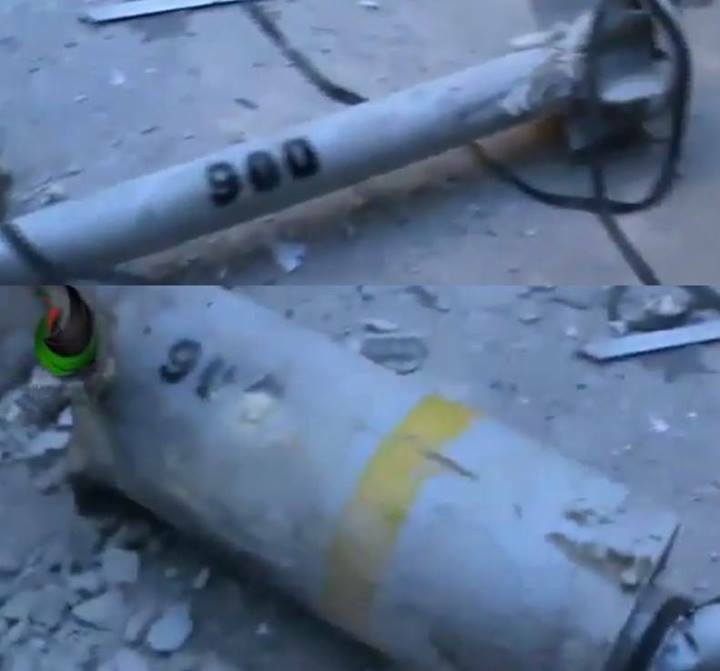 UPDATE 29/08/2013: Included image from ‘Alzahraa Alep News’ showing an earlier Falaq-2 and what appears to be the same unidentified munition. With thanks to Joe Galvin. UPDATE 31/08/2013: New images including rudimentary measurements, and new video footage of a presumed HE device. Available here. It appears increasingly likely that these munitions have been produced in at least two sizes. Whilst Falaq-2 launchers, or close copies or derivatives appear to be in use with munitions of this type (see two-tube model above), the launcher in the video at the top of this page may in fact be a larger calibre system developed along similar lines. UPDATE 20/09/2013: Updated top image and adjusted text to clarify possible use of different size munitions. My thanks to Eliot Higgins, who sourced most of the video material for this post, to John Ismay, Yuri Lyamin, and BA14 for their thoughts, and to several CW and EOD specialists who wish to remain anonymous, for sharing their expertise. 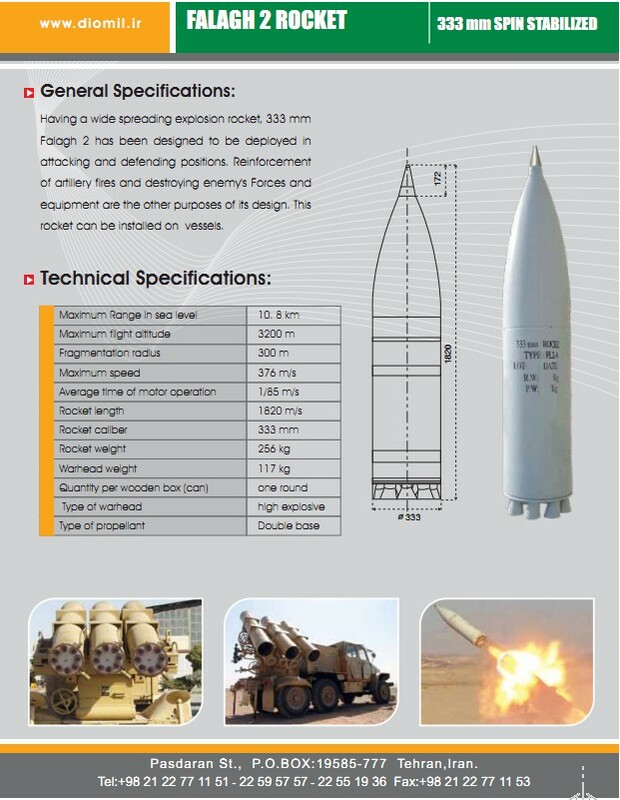 Below is a brochure extract showing the Falaq-2 launcher and its FL2-A rocket, from Iran’s Defence Industries Organization. The powder fill in one of the examples could be consistent with a FAE payload – for example fluoridated aluminium used in metal augmented charge versions of the hellfire missile (although it is bright white). An initial charge would rupture the casing and create a dust cloud of the powder that is then ignited by a second charge. The similarities with SLUFAE are interesting – the patent and drawings of this system are openly available, although it was never put into production and Iran pre-revolution would have been aware of this system (dominance of US systems in their armory at that time). SLUFAE had a very short range due to a small motor and proposed role. A little older reference to the launcher in Aleppo November of 2012. Same blue Med-duty truck with material handling crane and two white stripes. Update on alleged CW munitions in Syria: fired from Iranian Falaq-2 type launchers. I’m no expert at all, but the damage to the buildings where the remains of the rockets landed doesn’t look very severe to me. Am I right? Generally speaking, no, the damage does not appear to be severe in the examples we have seen. Would it then be logical to conclude then that a warhead with high explosives would have done more damage, and thus the bombs contained FAE or CW? That’s one possibility I think should be explored. Sun setting during the video, coming almost (5 o’clock) from the back of the rocket launcher at launching time. Noises in the background coming from the vehicles heading down the motorway, from where the video was taken. My guess is a firing from government controlled area, since there is a lot of traffic, which would be rare for a fighting area close to Damascus. Launching direction is estimated between 67° to 73°, almost perpendicular to the way where the truck is rolling back and forth. Shooting time around late afternoon. Truck heading 3- 4 times it’s lengths before turning left between 2:00 and 2:40, which should be around 40m – 60 m distance. Small thin, short, but really dark shadow can be identified in Google Earth (33°29’25.52″N 36°15’51.89″E), where the pole on the right side at 2:00 is located. Wheel base of the mercedes truck should be 3.6 m.
This maybe indicates the long tail but explosive version of the rocket being fired, if compared to the wheel base distance at 2:32. Also: Better not shoot chemical weapons above your own heads (close passing Central Damascus). The info about the launching area is correct and can be located by combining infos (terrain, noise, shadow casting,…) and searching in the airport region, but possibly it’s not the CW rocket version being shot. 1. The American Report (http://geneva.usmission.gov/2013/08/30/white-house-releases-assesment-of-syrian-governments-use-of-chemical-weapons/) indicates that the attack took place during the night around 1:00 AM, first reports of the attack coming in at 2:30 AM local time, this launch took place somewhere late afternoon or early morning (by the shadows) ~ 6:00 PM or 5:30 AM, given this (http://aa.usno.navy.mil/cgi-bin/aa_pap.pl). So it is impossible that this is proof of the SAA launching an chemical attack on 21 August. Now comparing the first picture with the first video it is quite noticeable that the video launcher is around twice the size of the Falaq-2 tube launcher (@03:27 a man stands in front of it and it’s from his head to his abdomen and that is not 33cm, more like ~ 50cms). Why is it that you are clearly linking this video(with a launcher that has a bore that would fit a full size man), with the photos of the much smaller outer diameter “CW” rockets? When men are loading the launcher, you can tell it’s MUCH larger that 330mm. It appears that there are at least two different sized variants of the same munition type, one of which is fired from the Iranian Falaq-2 or close copy, and one of which is fired from a larger system (possibly a derivative). Thanks for responding. I’m trying to make an informed decision before I call my faithful representatives in DC. Snarf. 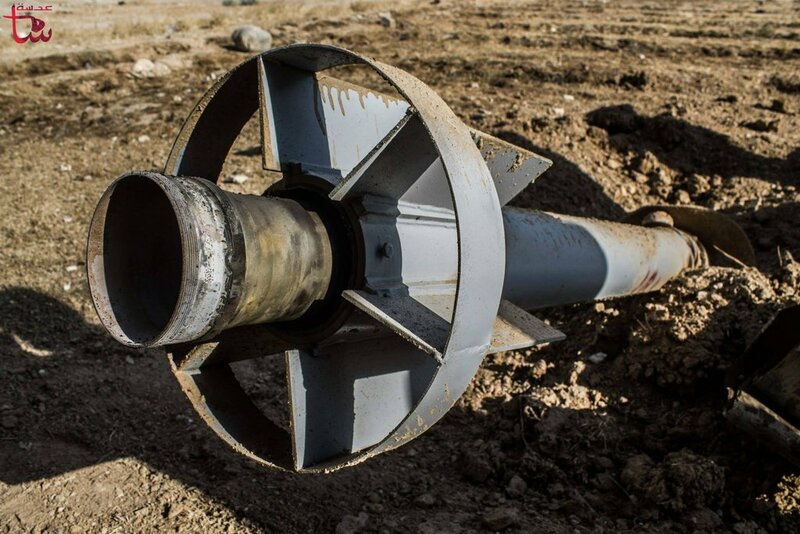 Is there any image/record/report of this LARGER munition being found at any CW site? Similar lines as in tube shaped lines? What makes this launcher similar to the smaller Falaq-2 and DISSIMILAR from other tube launch systems? Lastly, what makes this larger rocket similar to the small alleged CW rockets? I could say they are both similar to a 32 cm Wurfkörper. Payload in he nose, fuel in the back. One curious, perhaps damning, element: intelligence people analyzed the truck with the crane delivering the rockets, in the initial firing video. 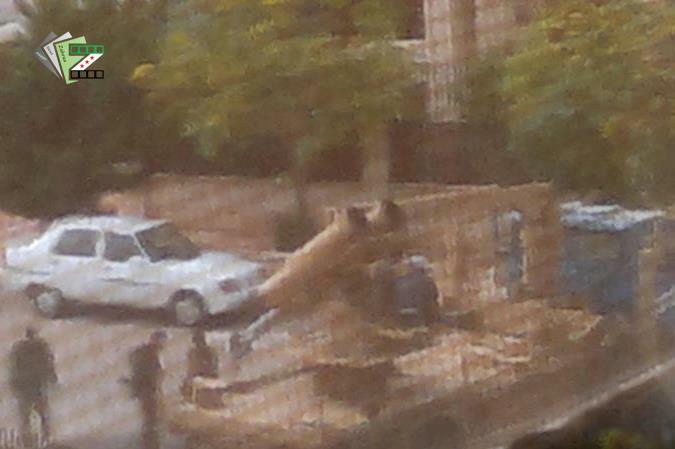 Apparently it is from the army terrain in the SW part of the Mezzeh airbase, north of the cemetery. The said truck, bringing the munition to the launcher, has an inscription in the back. It is not Arabic…but Farsi. Can anyone read what it says…? It appears blurred by the authors of the video. Why? Upthread commenter “JustTom” mentioned Wurfkörper which led me to the wikipedia entry “30 cm Nebelwerfer 42”. Is this an example of organisational inertia? i.e. WWII era military unit organisation and responsibility assignment copied and carried through to the current day! Even the weapon design hasn’t changed much. Are other Arab armies organised the same way? This impacts my thinking on the chances of this being a cockup. I’d suggest same problem with launching the spin stabilised rockets from these Iranian ones as was mentioned regarding Hell launchers. And to me these launchers look very improvised and not much like the Iranian ones though perhaps made to look somewhat like them and the rockets look about half as wide as for Iranian launchers. Red berrets – not beyond means of aquisition by rebels. Soviet rockets and launches – of course could well be for conventional Syrian army rocket attacks – but what about Libyan-Soviet imports and this getting through to rebels or even those very similar looking US/ Israeli rockets doing so (rebels funded/ supported by US 20006/7 – Wikileaks). Then you’re forgetting several videos/ reports – rebels promoting their chemical weapons use; reports about rebels developing CW in Turkey; CIA training in Jordan for chemical weapons handling of Syrians stockpiles (CNN); reports from the ground in Ghoutia implicating Prince Bandar for conveying chemical materials through to Islamist militants nearby – MintPress. Then two interviews before and after the June UN Commisioners report with UN’s Carla Del Ponte saying that Aleppo attack looked likely to involve rebels. And I forget – that June UN report referred to indiscriminate use by rebels of .. rockets. I am writing an article on the contribution of bloggers and new media to the depth of coverage of the Syrian War. You look like a “real deal” expert who also blogs, is that accurate? I would welcome your thoughts on other so-called “experts” who have recently begun blogging. How can I contact you? Thanks for the contact. You can get hold of me at: nic -at- jjagencies -dot- com. I certainly have some opinions on the matter, though I’d appreciate if you could drop me an email and identify who you’re writing for etc. There are lots of different people around the rocket, an array of different skin colours from white to black, some clearly wearing civilian gear, others wearing different parts of non-standard military gear. Some look civilian in blue jeans and open blue shirts, others clearly not. The guys with the red berets, appear to arrive with the red lorry carrying the rocket, and﻿ they seem to be almost guarding it, they also look more nervous, constantly looking around and checking, as if they might be discovered at any moment. Their body language is distinctly different from the rest of the persons present. Thank you for this posting. I think it would be helpful for all. Personally I like this post.